Most business owners have challenges surviving on the digital platform. This is because of the stiff competition from millions of other websites and the ever-changing search engine algorithms. Most businesses that do not benefit from digital marketing are those that have not fully invested in SEO or Search Engine Optimization. If your small business is not visible on the search engine results, then you will not notice any ROI. 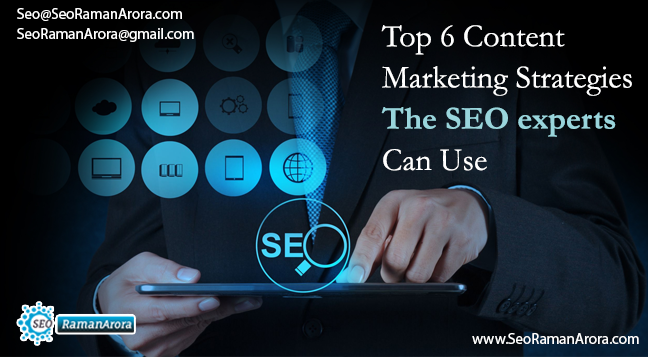 Content marketing is one of the most important SEO strategies that will help to promote your business website. Consumers will visit your website to buy and also learn from industry experts. Even though conversion is a crucial objective when it comes to digital marketing, you need to consider better engagement and customer retention by providing fresh and engaging content. With premium quality content you will likely convince your visitors to make purchases. Content marketing is crucial for the survival of your website online and your SEO expert should include it as part of your SEO strategies. Read on to know some tips that will help guarantee successful content management. In the past websites could earn better ranking publishing any type of content. However, today you need high-quality and relevant content because the search engines algorithms have changed over the years. Furthermore, readers are also looking for relevant and educative content and will spend more time search through your website if you offer what they are looking for. With quality content, you will be assured of lower bounce rates and better ranking on SERPs. An SEO expertlike RankRabbitwill help you create and publish fresh and relevant content for your target audience. Forrester Research confirms that over 62% of online buyers will only purchase products online after watching a marketing video. HubSpot also shows that including video in your emails helps to increase the click-through rates by 200 to 300%. Furthermore, including video content on your landing page increase your conversion rate by 80%. This shows that video content is supreme and should be included in your website content. This will help guarantee better engagement and increased conversion rates. Webmasters should take time to fully understand their audience. You need to know your target clients, their age, location, preferences, and many more. This will help you to create content that will suit your target readers. Personalizing your content will help you reach the kind of shoppers that you want on your website. Many consumers are put off by generic content that is geared towards marketing and you should avoid publishing such content. Most webmasters tend to ignore this important aspect of content marketing that helps your website to convert. It is essential to always have a clear call to action (CTA) irrespective of whether you are publishing video or text content. You need to provide readers with a direct action after they are done reading your content. You can direct your readers to make purchases, fill a contact form, share your content, call for additional information, or other actions that will help to boost your conversion rates. Many online users today use smartphones and other portable devices to access the internet. Your business website should be responsive and this means that the content should automatically fit different types of screens. An SEO professional will redesign your website to ensure that it is responsive and all users can read your content with ease. In the past, short posts were ideal because it was believed that internet users tend to have a shorter attention span. However, this is changing because studies now confirm that long-form content has more engagement. Most consumers who are likely to convert usually take time to research extensively and will not be looking for a few words about the services or products you are selling. Furthermore, search engine algorithms tend to favor long form-content and website owners should consider incorporating this on their website. How to Improve Website Visibility Using On-Page SEO Techniques? If your business is still struggling with poor ranking, you need to seek the services of the best SEO specialist to help you with content creation and management. These professionals are highly skilled and will produce quality content. Make sure that you agree on the type of content that suits your business in advance. For the best results, you must ensure that the content published on your website is relevant, high-quality, and fresh so that it can enhance the ranking of your website on the SERPs.